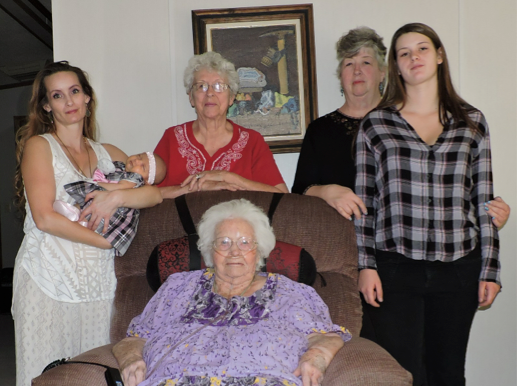 Pictured here are the SIX generations of Faye with new baby, Malia Faye Zoe, together with far right, mother Deanna Faye; far left, grandmother Crystal Faye; 2nd right, great-grandmother Cindy Zoe; and 2nd left, great-great-grandmother Verna Faye. Six generations of a Palisade family were together recently at the celebration to mark the 100th birthday of Faye Schwertfeger, mother of Palisade resident Lee Landsdowne of Lincoln Avenue. 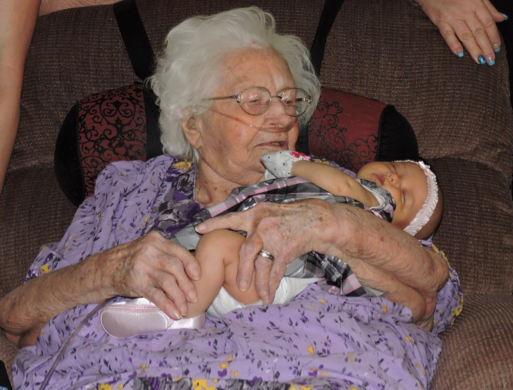 Ms. Schwertfeger actually celebrated her century milestone in February and was delighted to welcome little Malia Faye Zoe, her first great-great-great grandchild, in September, just in time for the party!